After the students learn time and length, the next concept they learn in Higher Primary school is speed. The length is equivalent to the distance travelled. 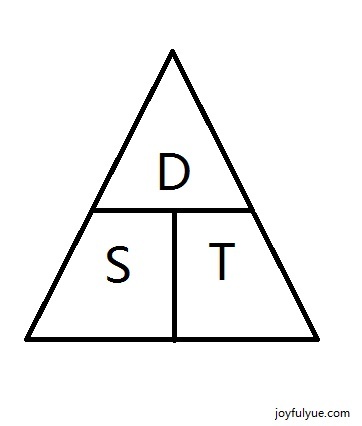 To help the students to remember the formula, a speed triangle is taught, as below. Taking the example from Counting Length, if I cycle to school at the speed of 15 km/h, how much time do I need to reach school? From the figure below, the distance between my house and the school is 180 m.
Please take note that the unit for speed is km/h and the unit for distance is m. Thus, the first step is to convert the two different units to the same unit. In our daily lives, we travel by cars and public transport. Use the speed concept in daily life and maybe the student can manage time better too. Enjoy your learning experience! 1. In Secondary school, the students will learn the term “velocity” in Physics, which is speed with a direction. 2. (a) Take note of the unit used. For distance, common units are km and m. For time, common units are hour, minute and second. The units used for distance and time determine the unit for speed. (b) Be fluent with unit conversion for distance and time. By Wendy in Mathematics on 21/05/2014 .